We saw her at the same time. My son Toby was downstairs, looking out. I was upstairs, looking down. 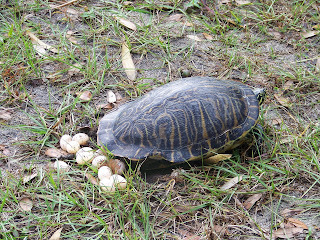 A turtle was laying eggs about 20 feet away from the house. We rushed outside together into the waning daylight. "That's amazing," I said, inching closer to snap a picture. "I don't think I've ever seen a turtle laying eggs before." Before we arrived on the scene, the hard-shelled reptile had crawled out of the lake and made her way up the rough ground toward a grove of bamboo. Before she got to the thicket of tall canes, she must have found a piece of ground she liked and began the process of reproduction. By the time Toby and I arrived, 14 eggs about the size and shape of slightly elongated pingpong balls lay on the ground around the turtle. I wondered aloud, "I thought turtles lay their eggs in holes. Why isn't she digging a hole?" The turtle, oblivious to the presence of two curious observers, had made a meager attempt at nest building. A small patch of grass was scratched away to reveal bare soil, but the scratch marks were just that: claw marks in the dirt. The indentation was hardly what one would consider a hole of egg-holding proportions. The turtle, apparently unperturbed by this obvious glitch in the evolutionary process, had proceeded to lay her eggs. "Do you think we should do anything?" I asked Toby. "Maybe we should at least cover the eggs with dirt when she's done." My 16-year-old son was adamant that we remain observers. "We should let nature take its course," he insisted. And so we did. After watching the turtle for a few more minutes and snapping about a dozen shots on my digital camera, it was getting dark. We left the turtle alone with her clutch of exposed eggs and returned to the house. First thing next morning, I went back out. As I expected, the eggs were all gone. Although a few remnants of shattered shells were scattered on the ground, one or more animals had obviously treated themselves to an easy meal. "I should have at least covered them with a box," I lamented over breakfast. My son again responded with analytic neutrality. "No, you shouldn't have. The turtle laid her eggs and other animals ate them. That's what happens. It's the cycle of life." Quite the mature statement from my almost-adult child. Although I accepted Toby's pronouncement and went about my day, something about the turtle episode continued to nag at me. Why didn't the turtle make a better attempt to cover up the eggs she laid, and more importantly, why did she choose this time of year to lay eggs in the first place? The end of December seems like an inauspicious time of year to produce offspring. To find answers, I pulled some reference books from my library and went online. The books and online information helped me identify the turtle as a Florida red-belly, Pseudemys nelson, but they left my other questions unresolved. Still eager for answers, I called Peter Pritchard, preeminent turtle researcher and former Time magazine "Hero of the Planet." After describing the reptile Toby and I observed, I asked the Oviedo resident and founder of the private Chelonian Research Institute if it was normal for a red-belly to lay eggs in the winter. "I'm not sure why it was trying to nest now," the zoologist said. "The Peninsula cooter and the chicken turtle are only two winter nesters. Red-bellies usually lay their eggs in the warm months." "What about the eggs?" I asked. "Is it normal for a turtle to leave eggs on the ground instead of digging a hole and burying them?" "Something must have messed up," he said. Florida red-bellies normally lay their eggs in a hole about 6 inches deep. Sometimes they use old alligator nests or decaying vegetation. What they don't normally do is leave their eggs unprotected on open ground. I then asked Pritchard the question that had been bothering me most. "Do you think I should have tried to bury the eggs instead of just letting nature take its course?" His reply took me by surprise. "If it were an intact world, we could let nature take its course, but there are so many interruptions to offset the balance. If you had dug a hole and buried the eggs, they would most likely have hatched." I felt terrible. A bit of effort on my part might have saved the lives of 14 turtles. It also may have prevented predators from discovering the eggs. "If you had picked up the eggs to put them in the hole, your human scent would have replaced the turtle scent and deterred raccoons and other predators," the scientist explained. So much for the notion of letting nature take its course. If I ever come across another turtle laying eggs without first digging a hole, I'll take Pritchard's advice and lend a hand. But, as Toby reminds me, by doing that, I'll prevent another animal from having a meal. Finding our place in nature is no easy task. Sometimes you just have to follow your heart. Very interesting story about turtles and their eggs. I'm guessing something was wrong somewhere....maybe the recent warm weather triggered the response. Bye the way, where is your column now? I can't find it anywhere. Poor Tom McCubbin's has been moved to the TV section. Whose bright idea was that??? ?